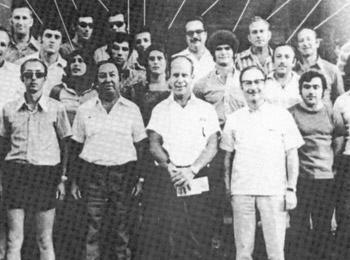 The Israeli Delegation at the 1972 Munich Summer Olympics. This Friday is the Opening Ceremonies for the Summer Olympic Games and all I can think about is the theme of last year’s American Association of State and Local History’s Annual Meeting, Commemoration: The Promise of New Beginnings. As has been discussed quite a bit in the media recently, this year marks the 40th anniversary of the Summer Olympic Games in Munich, where 11 Israeli team members were killed by members of the Palestinian Black September group. Despite the efforts of the Israeli team widows, Israeli and German government officials and the U.S. House Foreign Affairs Committee, the International Olympic Committee (IOC) has decided against holding a moment of silence during London’s opening ceremony. Public celebration is at the forefront of the international stage. Why must commemoration be solely a private matter? 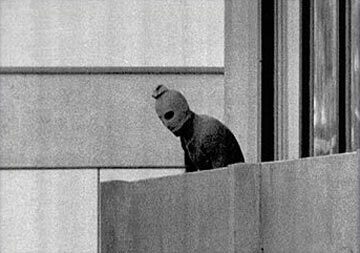 Member of the Black September group looking over the balcony of the Israeli team quarters at Building 31 of the Munich Olympic Village. There may be “politics” at play; however, the Munich 11 tragedy was not just an attack on Israelis. The images of the Munich hostage crisis are iconic, haunting and create a sense of anxiety and fear beyond the political players directly involved. This was an attack against the ideals of peace and everything the Olympic Games stand for. By denying public commemoration – the IOC is sending a message – a message that there is no room remembrance, celebration is the priority. The Munich 11 were husbands, fathers, brothers and sons. They were Olympians. They were national and international heroes. They deserve to be honored at the opening ceremony in London. Thankfully, Bob Costas of NBC has stated his intent to remember the Munich 11, while hosting the telecast of the Opening Ceremonies Friday night, very publicly, and in spite of the decision of the IOC. I obviously have my own opinions about commemoration and the role it can play in a situation like this. Am I wrong? Is the role of public celebration enough of a reason to ignore this important and tragic part of Olympic history? What do you think? Tags: 1972 Summer Olympic Games, American Association of State and Local History, Black September, Bob Costas, celebration, commemoration, Germany, International Olympics Committee, Israel, Jacques Rogge, London, Munich 11, NBC, U.S. House Foreign Affairs Committee. Bookmark the permalink.